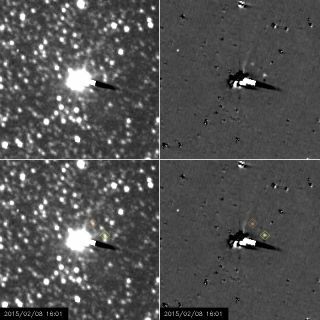 NASA's New Horizons probe captured these views of the Pluto moons Nix (yellow diamond) and Hydra (orange diamond) between Jan. 27 and Feb. 8, 2015. Pluto and its largest moon, Charon, are the fuzzy white blob in the images' center. Right-hand images have been processed to remove glare created by Pluto, Charon and background stars. "It’s thrilling to watch the details of the Pluto system emerge as we close the distance to the spacecraft’s July 14 encounter," New Horizons science team member John Spencer, of the Southwest Research Institute in Boulder, Colorado, said in a statement. "This first good view of Nix and Hydra marks another major milestone, and a perfect way to celebrate the anniversary of Pluto’s discovery." Hydra is Pluto’s outermost known moon and circles the dwarf planet every 38 days, at a distance of about 40,200 miles (64,700 km). Nix lies 30,260 miles (48,700 km) from Pluto and completes one orbit every 25 days.